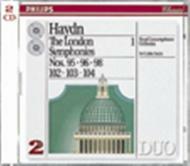 Sir Colin Davis�s Haydn series (recorded between 1975 and 1981) is one of the most distinguished sets he has given us over his long recording career, and its blend of brilliance and sensitivity, wit and humanity gives these two-for-the-price-of-one Duo reissues a special claim on the collector. ... The excellence of the playing is matched by Philips�s best recording quality, whether analogue or digital.